We ended about 5 months of travel through Central America in Panama exploring Bocas del Toro, Panama city and the cloud forest of the Talamanca mountains. 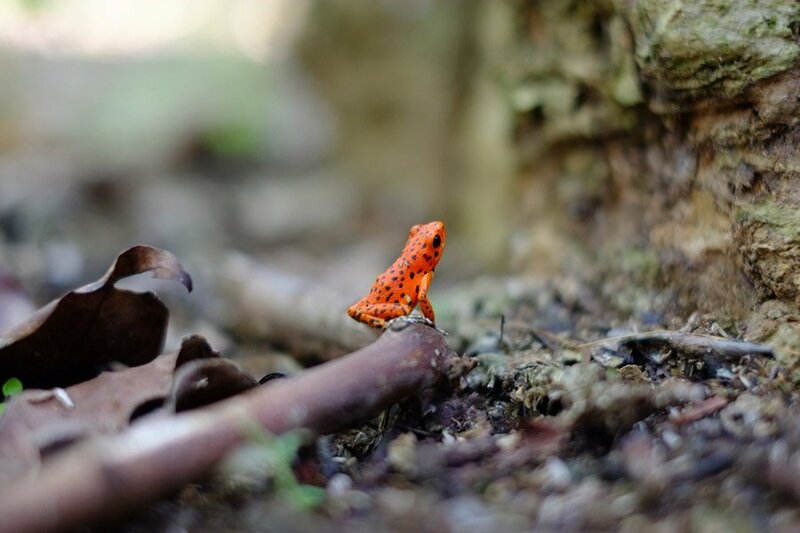 In this post we discuss our activities, budget and transport traveling in Panama. Panama was a dark horse in Central America, we did not know what to expect. Travelers coming from South America to Panama on a yacht visiting the San Blas islands could not stop talking about an untouched, perfect tropical paradise beyond imagination. Panama is a beautiful country with great natural beauty to explore, we found the it is a bit expensive by Central America standards, but the beaches and jungles were great and we had an awesome trip! The San Blas Islands, an archipelago is made up of 378 islands of which 49 are inhabited. Most backpackers do a 5 day all-inclusive tour from Panama to Cartagena in Colombia by sail boat for about $500. Unfortunately his was a bit steep for us and did not fit well with our travel plans, next time. Bocas del Toro, archipelago made up of six islands and many uninhabited islets with in Panama’s largest marine park, very popular with backpackers some cool surf spots. Panama Canal, this 50 mile canal in Panama city is one of the country’s nr 1 attractions, Miraflores locks is the most popular viewpoint. The Talamanca mountains, nice hiking trails in the cloud forests. Walking from Bocas Del Drago to star fish. Your two options for finding perfect deserted islands and beaches in Panama are sailing to The San Blas islands or traveling around The Archipelago de Bocas Del Toro. We decided to go to Bocas since it is only 30km from the border with Costa Rica. 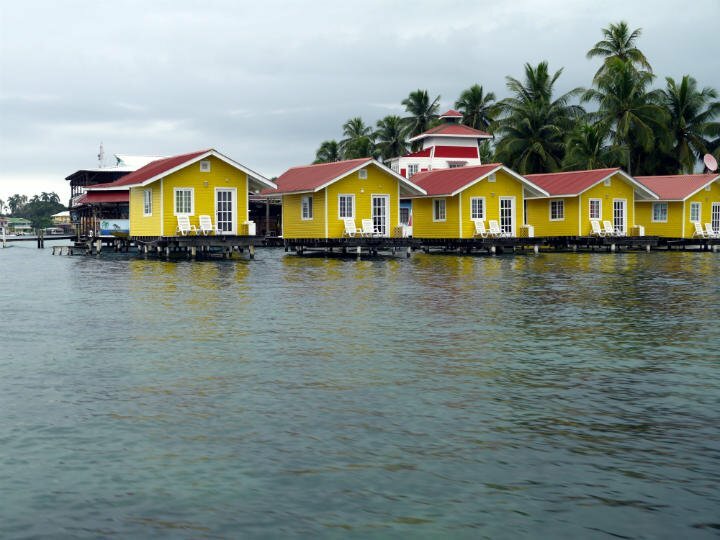 Bocas Del Toro town on Isla Colon is the easiest to reach by water taxi and was our first stop backpacking Panama. 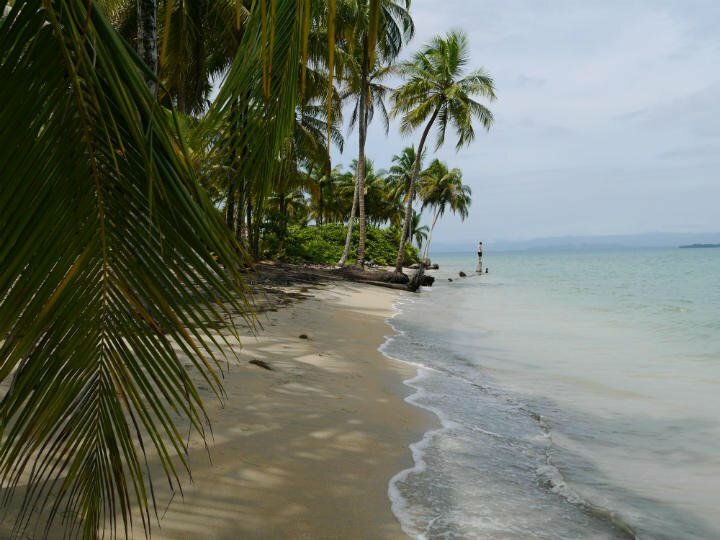 Bocas del Toro is actually an archipelago consisting out of 9 islands. 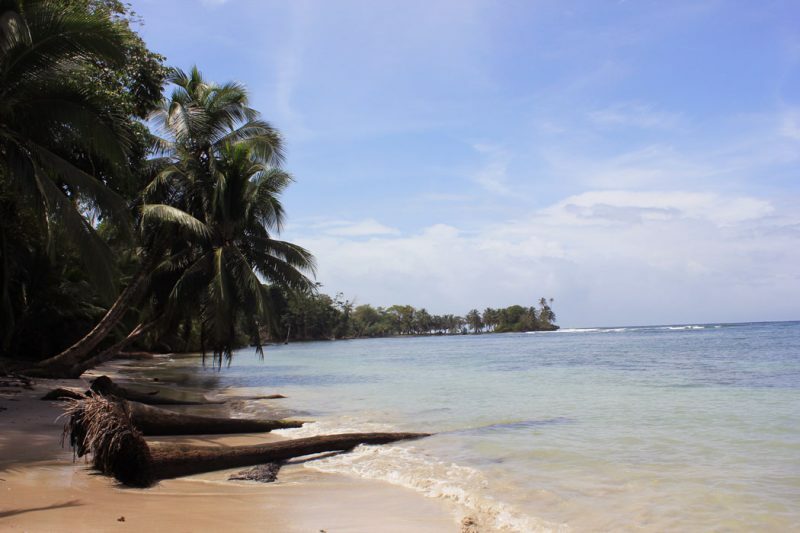 The destination typically referred to as Bocas del Toro, or Bocas Town, is located on Isla Colón. 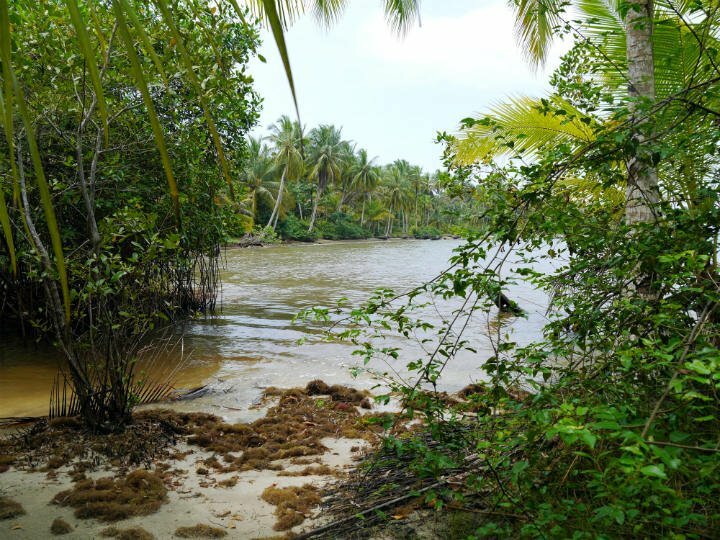 There is a lot to do around Bocas for active travelers, diving, surfing, snorkeling, fishing or just enjoying the beach and party vibe. Bocas Yoga is a fun activity, not crazy expensive. Bocas is very touristy and feels a bit like a touristy island in South East Asia. There are some stunning spots but unfortunately some very badly polluted places around Boca town. 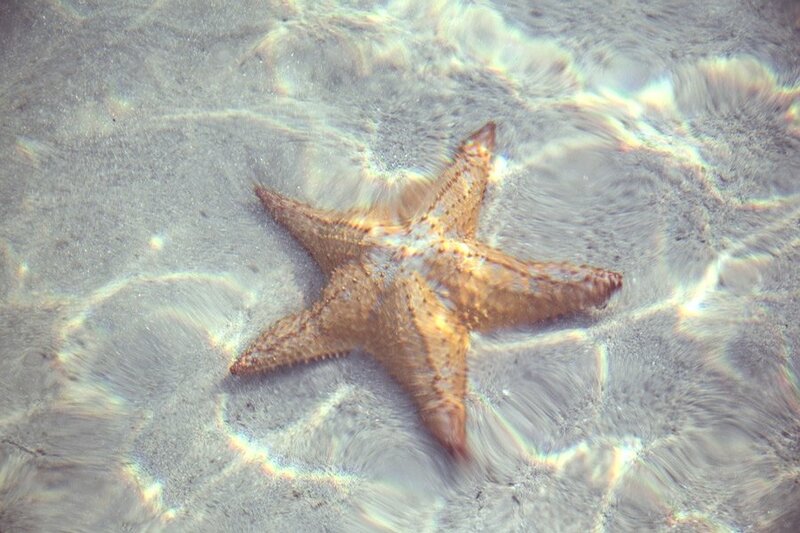 The famous starfish beach is really spectacular. The water was not crystal clear, but it was nice and calm and we could see many giant sea stars from the shore and snorkeling from the beach. A pod of dolphins passed by the beach a couple of times! Two beautiful islands about an hour by boat from Isla Colon, crystal clear water and perfect white sand, day trip. Just a couple of minutes’ walk from the town centre, there were a couple of guys on longboards paddling to catch knee high waves. But the water was dirty and not nice for swimming. 3.5km from town it is a quick bike ride, good beach for a swim. The stunning Playa Estrella (starfish beach). On a budget Hostal Hansi is a good deal with single rooms for $12 and doubles for 26. Clean, neat, nice garden, cool staff, excellent location. Midrange Barrbra BnB Over The Sea – a 2 story house built directly over the sea. Beautiful house, great facilities and super helpful owner. You can just chill on the deck with the great view, offer tours and snorkeling, cycling, diving, surfing and hiking can be arranged from here. Luxury Want to stay in luxury, central location with an ocean view? Tropical Suites Hotel is an oceanfront boutique property located in the heart of Bocas del Toro, Panama. All islands and ports are connected by water taxi. A short taxi ride starts at $1. Taxi 25 leaves from Amirante waterfront every 30 min to Bocas town ($6). Bicycles are very popular on the island, rentals cost $1 to $2/hr or about $8 for the day. Taxis are not expensive starting at $1 up to $10 for a long ride across the island. Buses cross the island towards Bocas del Drago a couple of times a day ($3 one way). On the way to Isla Bastimentos from Bocas del Torro. The chilled out Isla Bastimentos has a completely different vibe from Isla Colon. With much less people there was no party noises, we were swinging in hammocks at night listening to jungle sounds, frogs and howler monkeys in the trees. Go snorkeling, ask one of the locals to take you to the surrounding reefs, they know the spots, the snorkeling is good. 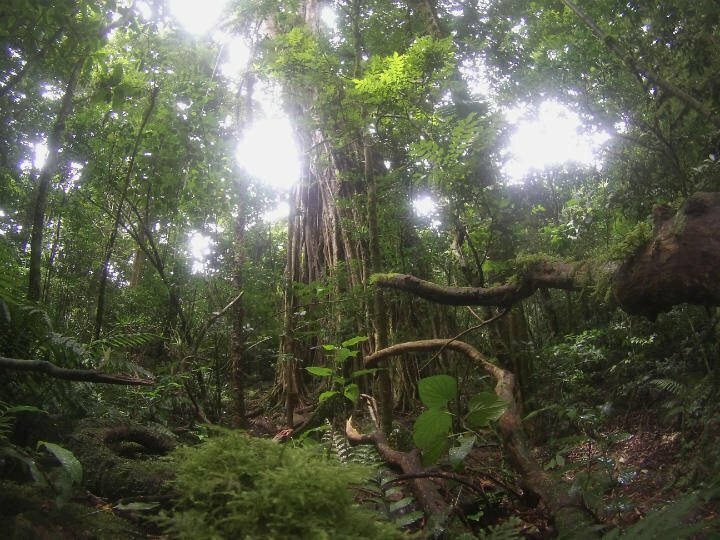 Walk through the jungle to Wizards beach and Red frog beach. Red frog beach is an amazing beach, with clear water and beautiful views. There has been a lot of stories of tourists getting mugged on the way here so be careful. From November to April the surfing in Bastimentos is really good. There are board rentals and lessons. Mid range Carmen’s place, this BB is not traditional, a beautiful house located in the jungle on the beach with great hosts. A beautiful area in the mountains about 60km from Boquete. Really nice hikes to do in the surrounding cloud forest. The views in the area is spectacular, there’s a waterfall, a canyon, horse riding, a place for cliff jumping and coffee tours to do. The trails through the cloud forest is amazing, with some monster trees and is free to hike. Lost and Found is an eco hostel in Valle Hornito about 60km from Boquete. This is a popular stop if you are backpacking Panama. The bus dropped us next to the road and from there it is a 15 minute hike uphill through the cloud forest to the lodge. It is a nice place but not a traditional Eco lodge, more a party hostel in the jungle, they had quite an innovative treasure hunt in the jungle. There is a kitchen, so you can cook your own food or buy all meals there at good prices. Refugio La Brisa del Diablo – want to stay in a bit more luxury with spectacular views of the surrounding mountains from a heated pool? This vibrant, cosmopolitan city is probably the most developed metropolis in Central America. 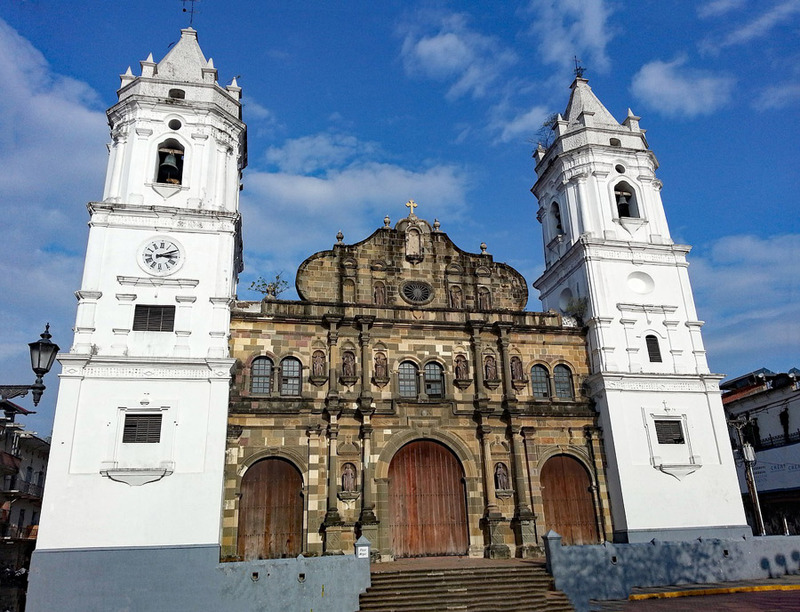 The combination of historic structures and modern architecture is interesting and Panama with its huge skyscrapers, famous man made canal and cobble stone historic center is something different on any Central America travel itinerary. It was quite a shock to our senses to be in a real city for the first time in months! Casco Viejo, also known as Casco Antiguo is the historic district of Panama City. Today the area is beautifully restored with nice streets, buildings and fountains, but still keeps it rustic edge. The area used to be dilapidated and dangerous, but was beautifully renovated after receiving UNESCO World Heritage Status. Currently this is the hip and happening area in the city with many hotels, restaurants and bars, the main tourist area and the best place to hunt for a hostel. Casco Viejo, also known as Casco Antiguo is the historic district of Panama City. It is an impressive piece of engineering and a must see if you are in the city. It is the reason why Panama is economically so far ahead of the rest of Central America bringing in millions of dollars every year. The most popular place to view the canal is from the viewing platforms at the Miraflores locks. To view the canal for free go to the Pedro Miguel locks, it is a very limited experience from here, you see the canal through a fence. 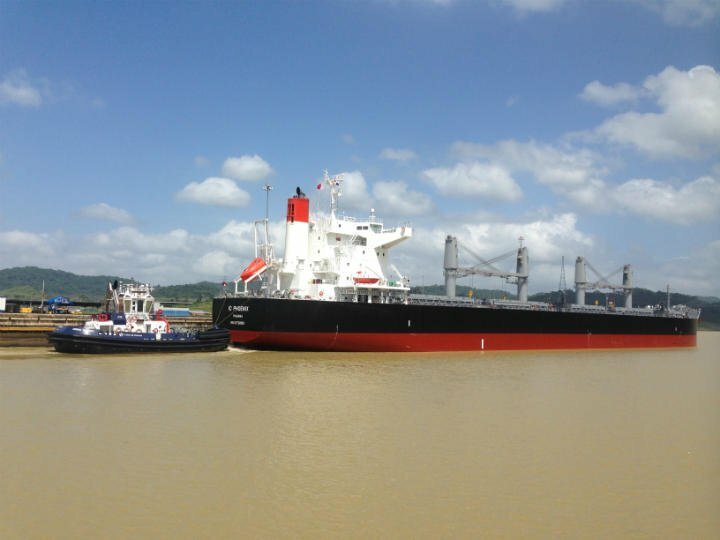 To properly experience this extraordinary piece of engineering see the wonder of the Panama Canal during its busiest period of the day, this Panama city tour combines driving you to the Miraflores locks with a guided walk through the enchanting streets of Panama City’s colonial district Casco Antiguo. Viewing the canal for free from the Pedro Miguel locks. 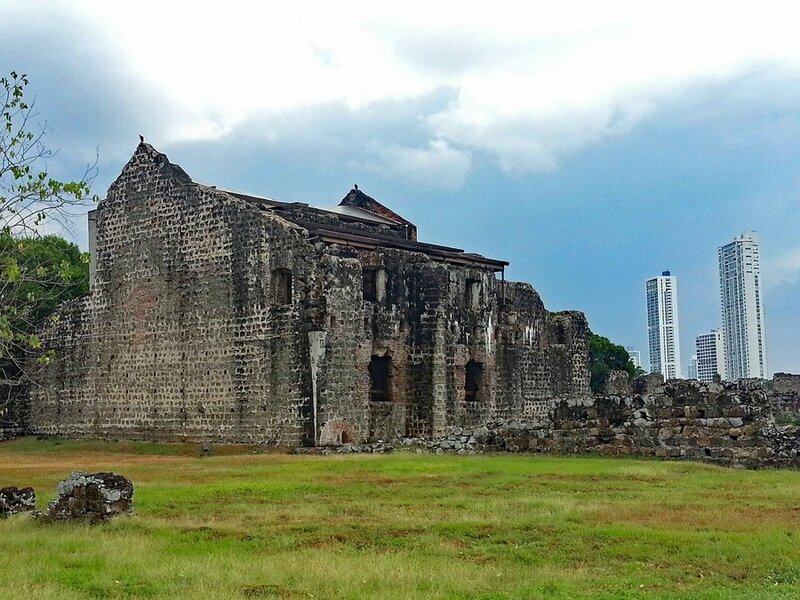 Panamá Viejo, also known as Panamá la Vieja, is what is left of the old Panama City and the former capital of the country. It is located in the suburbs of the modern city. The site is not very well advertised, but is really worth it the archeological remains and the two museums giving you a very good picture of the history of Panama. $15 to get into two museums and a free shuttle car between the two museums. Amador Causeway, named after the first President of Panama is one of the city’s best known roads. This 6km long road is very popular with walkers and cyclists. This is an awesome spot to watch the large container ships enter and exit the canal, and ferries regularly depart for the Pearl Islands from here. Panama City has a good Metro bus system and transport within the city is cheap. Albrook bus station is the main bus terminal and has a big mall linked to the terminal, you need an orange transport card with credit loaded to pay on the bus. On a budget El Machico Hostel One of the best rated backpacker hostels in the city, located in the Marbella distric popular location, great staff, awesome facilities from pool to a open air cinema, good deal at $14 for a dorm bed. Medium Price Casa Andrea fantastic B&B feels like home, the food is just better is what my friend said 🙂 big delicious breakfast, large clean and neat room, facilities great, top rated. Backpacking Panama we spent $242 in 10 days, at $24 per day. It is easy to make friends if you can make awesome coffee! The Aeropress is probably the best, rugged, light and portable device to have in your backpack for making top notch espresso style coffee! First thing I pack! A towel is an essential thing to have for an adventure or budget traveler. You don’t get towels in most Backpacker hostels and you can not take your hotel’s bath towels with you. Microfibre towels take almost no space, are light and dry easy so that they won’t get moldy and start smelling. 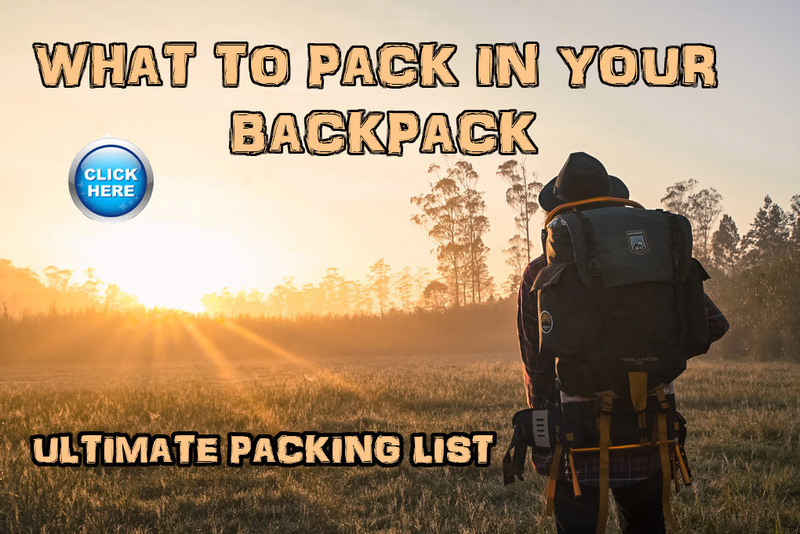 Backpacking Colombia - the ultimate guide. I am going to panama for a 2-3 week trip, leaving next week. I am wondering if you guys have experience with finding places to camp in Panama instead of hostels. My interest in travelling is stay off the beaten path and mostly explore the natural beauty and culture of the place. 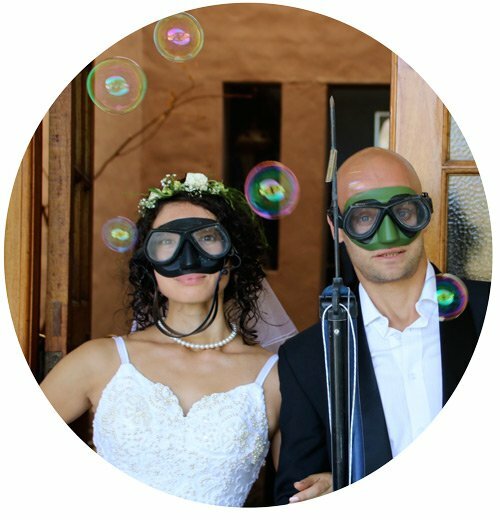 I am an outdoor enthousiast, I like hiking, camping, rock climbing, surfing, paddle boarding, pretty much any outdoor activity. I would like to hike Vulcan Baru an climb in Boquette. If you have any recommendations for other places to go, things to do on a restricted budget, and input in regards to camping in Panama that would be great! 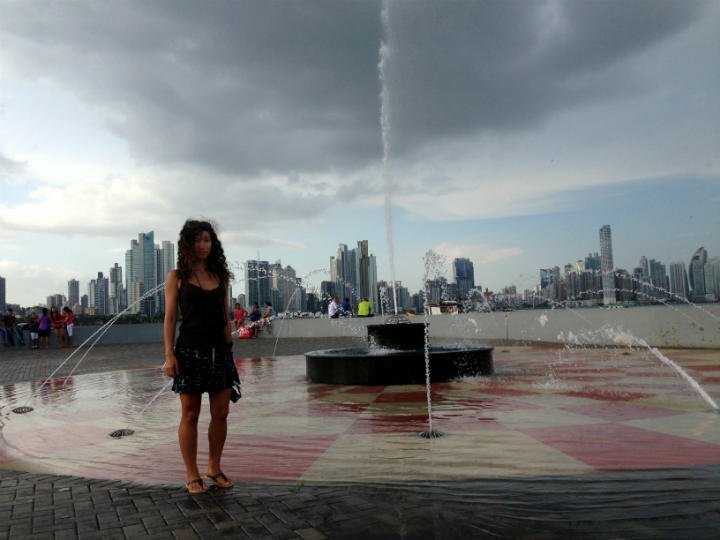 I have been to Panama once before, but it was visiting my father and we stayed in a hotel and rented a car and checked out some of the touristy basics. This time I want to travel around with my backpack and camping gear.